Monica Maschak - mmaschak@shawmedia.com Nelson's Jewelry co-owner and goldsmith Richard Nelson repairs jewelry that customers bring into the store. Monica Maschak - mmaschak@shawmedia.com Sue Nelson of Nelson's Jewelry took a trip to South Africa to partake in orphanage work. 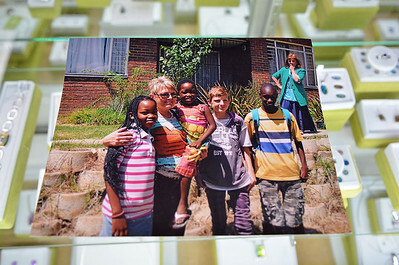 The jewelry store's private gem supplier, based in South Africa, donates money to refurbish houses for orphaned children. Monica Maschak - mmaschak@shawmedia.com Nelson's Jewelry co-owner Richard Nelson helps to remove a ring from Suzanne Griem's finger. 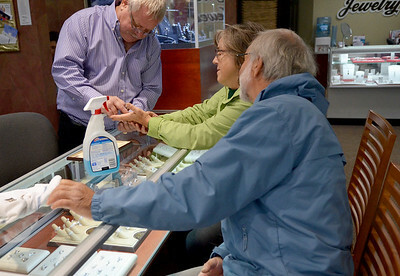 Suzanne and her husband, Bob, came to Nelson's to get their wedding bands resized for their 42nd anniversary. "We've been customers with Nelson's for a long, long time," Bob said. The family-owned jewelry store in Crystal Lake has been in business for 50 years. 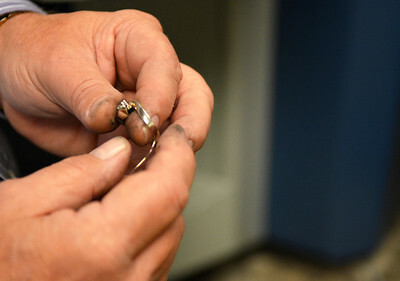 Nelson's Jewelry co-owner Richard Nelson helps to remove a ring from Suzanne Griem's finger. Suzanne and her husband, Bob, came to Nelson's to get their wedding bands resized for their 42nd anniversary. "We've been customers with Nelson's for a long, long time," Bob said. The family-owned jewelry store in Crystal Lake has been in business for 50 years.